These have 5 1/4" midbass/ midrange drivers. These are Birds Eye Maple finished in piano gloss. These are the ORIGINAL QUAD L2's made in England and NOT Chinese made. Quad 11L2 can work as stereo pair in a small room or rear pair in multi-channel complexes. The final coat is polished to a high gloss finish to produce one of the finest finishes seen on any loudspeaker in this class. Product: ESL-989 electrostatic loudspeaker Manufacturer: Quad - UK Approximate price: e7000 (UK), e9000 (export markets) Test sample: auditioned at dealer's (multiple sessions). QUAD Z2 in PIANO ROSEWOOD. The Z Series is the pinnacle of Quad’s enclosure speakers and features the largest ribbon treble unit that Quad has ever used, giving the Z Series a clarity and definition throughout the upper midrange and treble that is utterly beguiling. Used pair of black Quad ESL57 Electrostatic Speakers Upgraded. These are the newer ESL57 speakers with the updated EHT board. The sound is perfectly wide which allows the frequencies to be separated for clarity, transparent so you hear sound in such great detail. All panels inspected and stators reglued for trouble free listening. Cerwin Vega has been the worldwide leader in loudspeaker design for over five decades! And now, with the SL Series, we bring you our legendary power and excellent sound quality in an all new design. 4.0 Bluetooth Lets You Wirelessly Stream from Any Bluetooth Devices. Or Optical with Fast-transmission Connects Your TV. Dual Wired & Wireless Installations: Stream Audio Over Bluetooth From up to 33 ft / 10 m or Connect Via Line In, RCA, or Optical With the Included Cables. 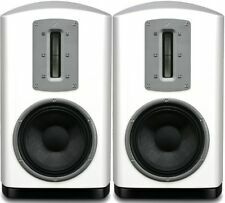 B&W 686 speakers.boxed. B&W 686 speakers.good condition and in good working order. far East £95. QUAD 11L2 SPEAKERS Cherry GLOSS PAIR, boxed. The Quad Z2 bookshelf speaker is the larger model to the Z1 and a step above the S2 model from Quad's S Series. REST OF THE WORLD £92. Make Supersized seem small. REST OF THE WORLD £95. Quad 8" inch speakers and crossovers. 4ohm 125w. Fantastic pair of speakers that has been altered for demestic setup. Clearly a alternative to tannoy speakers. The tweeters have a 2" inch aluminium built in to the back of the magnet. Project that I have never had the time to finish, hope that so one has the time to make the most of a high end speaker system. TANNOY 12" BLACK cone.genuine original.this was open circuit so I removed it from the 12" TANNOY BLACK and had a new coil fitted.as you can see it doesn't look so original anymore but the important thing is the 'cone' is still a genuine 'black' so it will sound correct.it is in good working order.re-listed with more pictures as requested. TANNOY 12" red cone.genuine original. TANNOY 12" red cone.genuine original.good working order. Lovely pair of ROGERS JR150 speakers in great condition.working exactly as they should. 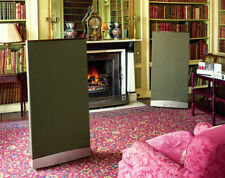 EARLY PAIR OF KEF CRESTA SPEAKERS with early large magnet SP1003's. Get images that. None type of cables are included, but considering you can use regular stripped cables, this won't be a problem. Type: self-polarizing electrostatic loudspeaker system. Only one corner is a little bit dented. Quad L-ite Plus is a home theatre speaker system which will deliver a real cinematic experience in your own home, from beautifully constructed cabinets that will look great in even the most stylish of rooms. 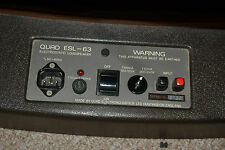 Full Quad ESL57 service by One Thing Audio(Leicester) You supply the speakers. 12 months RTB warranty. Many are now tired and needing a proper overhaul to bring back to full specification for a very reasonable price. Due to heavy workload it can take upto 6 weeks to complete the work. These loudspeakers were fully re-built. NEW – Unused in sealed box. 1/10 – Deceased. For parts only. 2/10 – Very Poor. Sold as seen. 3/10 – Poor. Bad, physical condition, all features functional. AVI BIGGA-TRON loudspeakers finished in cherry.good condition and in good working order. make Supersized seem small. Get images that. FINITURA DISPONIBILE MOGANO. COPPIA DIFFUSORI. PREZZO RIFERITO ALLA COPPIA. QUAD S-C BLACK OAK. FINITURA BLACK OAK (ROVERE NERO). IL PREZZO SI INTENDE PER IL SINGOLO PEZZO. Numéro de pièce fabricant ESL2805. QUAD Z2 WHITE (COPPIA/PAIR). After taking a new approach to ribbon tweeter design using a unique sandwich formation, an exceptionally robust, high power speaker has been engineered, yet with the delicate sound conventional ribbon speakers are known for. QUAD 11L CL SIGNATURE VENEER SAPELE MAHOGANY COPPIA DIFFUSORI LIBRERIA G.UFF. VENEER SAPELE MAHOGANY. QUAD 11L CL SIGNATURE. COPPIA DI DIFFUSORI. IL PREZZO E' RIFERITO PER LA COPPIA. FINITURA BLACK OAK (ROVERE NERO). IL PREZZO SI INTENDE PER LA COPPIA. Numéro de pièce fabricant ESL2805. nur ein paar zur Verfügung. QUAD Z3 BLACK PIANO. FINITURA BLACK PIANO (NERO LACCATO). PREZZO RIFERITO ALLA COPPIA. QUAD S-4 SAPELE MAHOGANY. FINITURA SAPELE MAHOGANY (MOGANO AFRICANO). IL PREZZO SI INTENDE PER LA COPPIA. FINITURA DISPONIBILE BLACK. IL PREZZO SI INTENDE PER LA COPPIA. QUAD S-C SAPELE MAHOGANY. FINITURA SAPELE MAHOGANY (MOGANO AFRICANO). IL PREZZO SI INTENDE PER IL SINGOLO PEZZO.